Worker bees can not lay eggs and are smaller than the queen. It is the smallest hive inhabitant, but with all her sisters it is the main driving force in the functioning of the hive. The workerbees takes care for the food supply, water supply, nourishing of the offspring. These are just a few tasks the worker bees fulfill, they carry out a dozen more tasks. In this post we will follow the birth of the workerbee. Also we will get to know more about the role of the workerbee within the hive. It all starts with the egg, which is laid by the queen. The queen decides if the egg is an fertilized egg or non-fertilized. If it is a fertilized egg the workerbees decide if the egg will become a queen or a workerbee. Because the hive needs more worker bees than queens, the majority of the eggs are nourished to normal workerbees. Queens get higher quality food. After the queen laid the egg in the cell the development to worker bees will start. The development of the workerbee can be devided over different days. Day 1 – 3: on day one the egg is laid in the cell, it takes up to three days until the larvae will hatch from the egg. The larvae starts too feed itself with the food that is given from the nourishing worker bees. Day 3 – 9: The feeding will continue for six days after the larvae will spin itself into a cocon and start to pre-pupate into a bee pop. 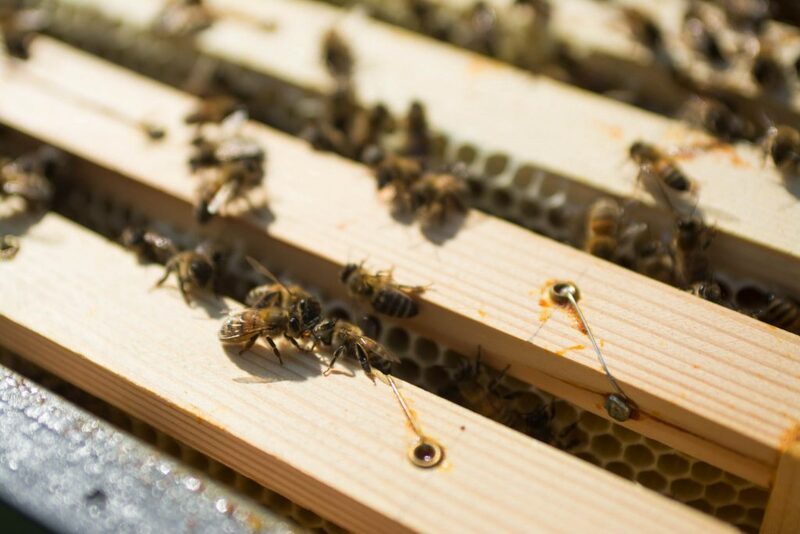 This is after the workerbees cap the comb chamber with a small layer of wax. Pre-putating is characterized by seeing the pup structures within the skin after the pup has spon itself into the cocon. Day 9 – 21: After the pupating is finished the bee pop remains popped for twelve days. After the 12 days the bee will appear out of its pop and chews the wax cap away. A short time after it’s birth it goes straight to work. After hatching from the cell the bee will start its new life within the hive. The new born bee starts the first 21 days within the hive. What I find one of the most intriguing thoughts is that the bee instinctively knows what to do instantly. During these 21 days within the hive it follows up several roles. Day 1 – 2 Cleaning: Shortly after the bee is born it gets to work. The first few days it has the task to clean cells of recently born bees. Day 3 – 5 Feeding older larvae: The next task is feeding of older larvae. This will continue for 2 to 3 days. Day 6 – 11 Feeding young larvae: After feeding older larvae it will also start feeding younger larvae. This due to the developement of the feeding glands. Day 12 – 17 Building: After the nursing period it is time for the bee to shift it’s duty to the more heavy work. It will start producing wax. The bee will build the new comb (honey chambers) within the hive and will also start processing the collected nectar/ pollen and propolis from the flying bees. Foraging bees need stay at home bees to collect the goods found. A foraging bee is not able to process the nectar or water by itself. Day 18 – 21 Guardian: Guarding the hive against intruders is a very important task. The task is normally done to older bees because the poison to sting needs time to ripen. After their hive duty they start the tough journey of foraging outside of the hive. After approximately 21 days the bee will start its new life in the beautiful but tough outdoors. It will risk her own life to collect nectar, pollen, water and propolis for the hive. The bee must withstand itself from spiders, bird and other dangers. In her short lifetime the bee flies can fly up to 800 kilometers and can pollinate up till 5000 flowers on a single day. Most of our food is dependant on the honey bee for pollination. Propolis is used as for building and desinfecting, Pollen are the main protein source for the hive and nectar is the fuel the bees fly on. The lifetime of the bee really depends on the season. When it is summer the bees really get it tough outside of the hive and the bee literally works itself to dead. The average lifetime of the bee as described above is approximately 6 weeks. The winter bee can live up to 6 months. The first winter bees are born in september and live through the winter in the hive. in the spring the cycle start all over again. When the bees are processing the nectar, the bees add special enzymes before they store it into the honeycomb cell. The flying bees need other bees to process the collected nectar. For example when the bee arrives within the hive it will put its tongue out to let other bees know it has nectar available. The bees will stick out their tongues to transfer the nectar collected. This is the same for pollen and propolis. Before the honey is eaten, water is added to dilute the honey water concentration. Sometimes enough water is available into the hive and the bees who collected water, wander in the hive for days. waiting for another bee too relieve it from their water. This order of activities is not always the true ideal. It really depends in the hive what is necessary. If there are many bees to take care of, fewer bees will make comb. if there are less bees to take care of more bees will fly outside of the hive. The hive can regulate what is necessary and need to get done. When a larvae is hatched, it receives food from the worker bees. It has been calculated that in a period of 6 days the larvae is feeded approx. 2070 times. This is a average of 414 times a day. After the bee hatches from the cell, it can feed itself right away. Bees get a mixture of honey and pollen. Pollen are the main source of protein. The bees need this to grow sufficiently and get strong. If there is few pollen available the hive starts to produce bees with a shorter lifespan. A rule of thumb: 1 gram of Pollen is needed for 7 grams of bees, so for 10000 bees 1.4 kg of pollen is required. Swarming of Honey bees - Everything you must know!